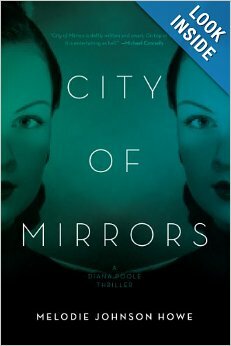 Melodie Johnson Howe’s latest novel, the detective thriller City of Mirrors, is a fun romp through Los Angeles with an unlikely heroine, the aging starlet Diana Poole. When the novel opens, Poole is mourning the loss of her screenwriter husband and the even more recent death of her movie star mother. Poole is forced to go back to work and lands a part in a movie. But things begin to go seriously awry when Poole agrees to visit the young star of the film and discovers her body in a dumpster behind her apartment. Poole turns detective, and the more she uncovers, the more things don’t add up, but bodies do. This is Johnson Howe’s second Diana Poole mystery (the first was Shooting Hollywood, 2012), and its considerable twists and turns will both amaze and delight readers. Poole is a wonderfully complex character, and Johnson Howe has masterfully captured the angst of an aging actress who’s suddenly alone. She worries about how she’ll support herself without her husband, and frets that the one job she’s been able to land will somehow disappear (it does). Coming to terms with her contentious and tenuous relationship with her narcissistic late mother is an underlying theme that will resonate with anyone who has struggled with an overbearing parent. Despite her very real fears, Poole is a fearless and smart detective, and Johnson Howe’s brilliant plot keeps Poole – and readers – guessing until the final page. If you love mysteries, this one belongs on your books-to-read list.